After reports that Cate Street Capital's proposed wood-fueled Berlin Station in Berlin, N.H., was dead in the water, a new agreement established this week could bring plans to build the 75 megawatt facility back to life. Vineyards LLC is developing a data center campus, Vineyards Data Center Park, which will be powered by a 50-megawatt biomass plant. The use of biomass for energy provides attractive power pricing that should be enticing to potential occupants. Millar Western Forest Products Ltd., a market pulp mill in Whitecourt, Alberta, Canada, hopes to build a 5.2-megawatt biomass power plant that would use its mill wastewater. The mill produces pulp that is sold to paper mills. 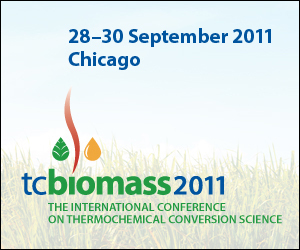 The American Biogas Council is looking for support for the Waste-to-Energy Technology Act of 2011 (H.R. 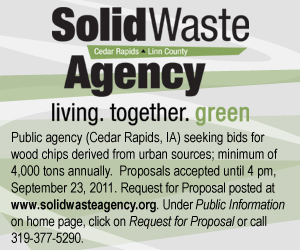 66), which would provide a 30 percent tax credit to eligible waste-to-energy facilities using municipal solid waste or sewage sludge. The U.K. Renewable Energy Association on Aug. 23 launched its Back Biomass campaign, aimed at ensuring suitable levels of government support for biomass power and combined heat and power. A $5,000 research grant was awarded to undergraduate students from the University of Illinois at Urbana-Champaign by British Petroleum. The purpose of the grant is for students to learn the engineering properties of biomass. Rolling out commercialization of its demonstrated biomass feedstock-flexible gasifier, ICM Inc. will pair the system with Eisenmann Corp.'s wet electrostatic precipitation emission abatement technology. Fram Renewable Fuels, a wood pellet producer in the U.S., has entered into an agreement with Telfair Forest Products to build a wood pellet manufacturing facility at TFP's Lumber City, Ga., location.